A pencilled note on the back of this postcard published by O.J. Morris of Beulah Hill, Norwood, explains that it shows the aftermath of a boiler explosion that occurred at Lewes station on Saturday 27 September 1879. 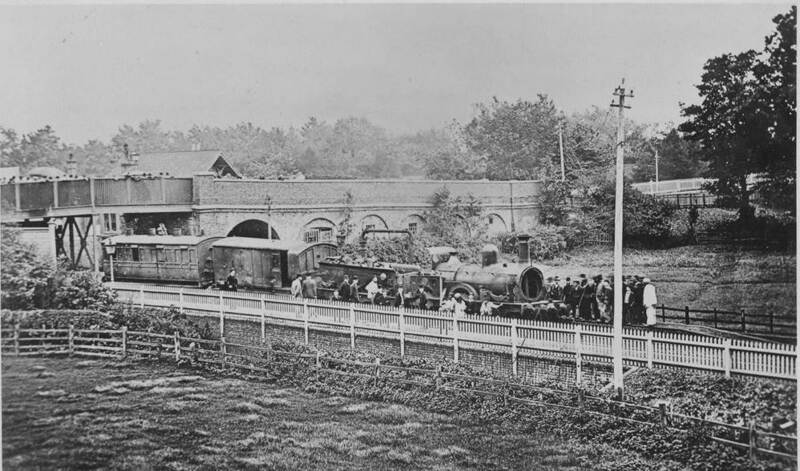 This is the 1857 station, before it was rebuilt in 1889, but the bridge over the railway is immediately recognisable. The engine was Craven 2-4-0 number 174, owned by the London, Brighton & South Coast Railway. It had been built in 1864, and then rebuilt by W. Stroudley in 1871. William Stroudley was appointed locomotive superintendent of the LB&SCR’s Brighton works in 1870, following J.C. Craven’s enforced resignation. Its cab was open to the elements. Surprisingly the engine survived this event. It was renumbered as no.488 in July 1881 and then became no.454 in October 1887, before being scrapped in 1889. An account of a notable Sussex smuggling incident was published in 1747 by the Ordinary (Chaplain) of Newgate Prison. It told the sad story of the conviction at the Old Bailey of Richard Ashcroft, aged 44, who was born at Lewes. He was “bred to follow the Plow and other parts of Husbandry, as his Father had done before him, so that his Education you may imagine was not much”. However, he married and became a fisherman and lived at Bishopstone. He and four others, including a woman named Elizabeth Dennis, were charged with a string of crimes including assault and affray, carrying firearms and other offensive weapons “to assist in the running and carrying away [of] uncustomed goods liable for duties which have never been paid”, and for unlawfully, notoriously, riotously and feloniously assembling with 30 unknown others and obstructing the excisemen. All five were sentenced to death by hanging. The Ordinary writes sympathetically, if patronisingly, of Richard, telling how he was known by his neighbours as a quiet harmless man, with a wife and seven children, until he fell in with a “dissolute and notorious Gang of Smugglers” (possibly the famous Hawkhurst Gang who were active in Sussex at that time) “who are become the Terror of many of the inhabitants of the Country, and so of late he became a little troublesome himself”. “As his employment of fishing led him down to the seaside he was often in their company and drank with them,” the Ordinary says, but he always insisted “that he never had any interest or advantage among the smugglers”. On the day in question Richard Ashcroft claimed he only came by chance upon the mob of 30-plus armed smugglers when he was on his way back on foot from a visit to Eastbourne. They had just landed a cargo of prohibited goods and were conveying these away on horses, one of which they allowed him to ride on. Unluckily for them they were ambushed in “South-Lane” by a posse including five excise officers and a fracas ensued. Most of them fled, but Richard and four others were arrested. In Newgate Prison Richard told the chaplain that “he knew they were about illicit business, but had not the least notion of an Act or Proclamation which might touch or affect him for being in such company”. He carried no manner of offensive weapon himself, but acknowledged that his sentence for being in the company of three or more who carried arms, contrary to express law, was just. He simply lamented the unlucky and fatal day, not only that he was seen, but that he should ever be in such company. The Ordinary described him in Newgate as “giving himself up to this Fate with all the patience and resignation which a man of his mean apprehension, and in such circumstances, may be supposed to be master of”. What is more, he heartily lamented the evil ways of his past life, such as “prophane Cursing and Swearing and not keeping the Sabbath according to the Commandment”. Or so the Ordinary said. Between 7 and 8 a.m. on the day of execution Richard and another of the group were carried in a cart to Tyburn gallows, attended by a company of soldiers commanded by Lord Manners. At the end they are said to have died piously, the Ordinary observing that they “behaved with Decency” after listening to the Lord’s Prayer, which both “wished they had been earlier acquainted with”. His wife had died in childbirth while Richard was awaiting trial, leaving their seven children to the mercies of the parish after his demise. Source: This account is based on the Ordinary of Newgate Prison’s Accounts of the Behaviour, Confession and Dying Words of the Condemned Criminals Executed at Tyburn (http://www.oldbaileyonline.org/static/Ordinarys-accounts.jsp). These were something in the nature of “press-releases” published by successive Newgate chaplains from 1676 to 1772, containing the stories of the 2,500 people executed at Tyburn in that period and running to 400 editions. They were sold on the streets or in the shops at price of 3d or 6d, and were hugely popular with the citizens until interest in ordinary criminals faded in the late 1700s. Most of the Ordinaries were no doubt trying to pursue a moral and didactic goal in publishing their accounts, but at the same time it was a fairly lucrative sideline – worth as much as £200 p.a. in the early 18th century, the website estimates. There is a nice reproduction of a 1747 Hogarth print on the website showing the Ordinary watching from his carriage as a convicted man is taken by cart to the Tyburn scaffold. This miracle is attributed to St Richard de Wyche, bishop of Chichester 1244-1253, who was canonised in 1262. While this catch may seem unimpressive compared to the shoals of large fish caught in similar miracles by Jesus himself, the fishermen and bailiffs considered it memorable. This is also one of the earliest references to the existence of the Franciscan Greyfriars in Lewes, preceding their contribution to the negotiations following the 1264 Battle of Lewes. Sources: Salzman, L.F., Sussex Archaeological Collections (1925) vol.66, pp.62-82, Luke, 5:4-7 and John, 21:11. Lewes auctioneer Plumer Verrall sold anything he was asked to – estates, individual houses, business stock in trade, wine, investments, standing timber and crops, livestock, farm equipment and furniture. He sold whole households, or individual items such as beds, chairs and pianos. He and his son often bought and sold items in the sales on their own account. 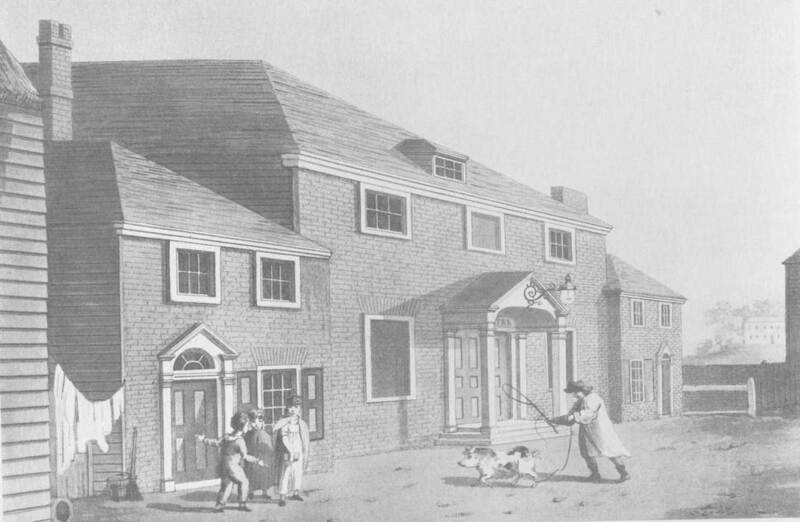 In the 1830s a poor farm labourer’s cottage might sell for £50 or even less, but houses in the town were usually more expensive – a pair of cottages in St John Street that fetched £174 in Dec 1837 were near the bottom end of the market. However, a smart and commodious house in a good position on the High Street might sell for £1,000 or even more. On 10 November 1838 Plumer Verrall put up for sale two dwelling houses with a range of stabling situated near the Bowling Green and within the precincts of Lewes Castle. They had belonged to John Shelley, who had recently died. The two houses were sold as a single lot, but when bidding stopped at £1,025 they were bought in by his estate. Later that month John Shelley’s furniture at Castle Banks House was sold successfully for £55 1s 6d. Source: Mark Antony Lower, ‘Hand-book for Lewes’ (1845). The East Sussex Hunt, based at Rushey Green, Ringmer, had closed in 1844. “The inhabitants of Lewes are too commercial in their character (and – shall we say – too intellectual in their pursuits?) to need the excitement of public amusements. The Theatre, which occupied the site of the Mechanics’ Institution, was never well supported and has long been abandoned. The Races held in the month of August once had some celebrity. George the Fourth, during his regency, was their principal patron, and was accustomed to take up his residence in the town during the three race days. On the single day now devoted to the sport, the Queen’s plate of 100 guineas is still run, or rather walked for, it often happening that only one horse is entered. The East Sussex Hunt Races, formerly supported by the sub-gentry, and held on Easter Monday, are now totally discontinued. Cricket seems at present the favourite sport, and the Dripping Pan is said occasionally to witness ‘magnificent’ bowling and batting of the most ‘splendid’ description. There is an excellent bowling-green within the castle precincts, to which non-subscribers are admitted on the payment of one shilling. This 1804 print features is titled ‘Lewes Theatre’. I assume this is the theatre on West Street, later replaced by the Mechanics Institution and then the old Police Station, although I can’t quite fit the background. I do like the man walking his pig, with a lead fixed around one of its rear ankles. This entry was posted in Cultural History, Ecclesiastical History, Legal History, Lewes, Local History, Social History, Transport History and tagged auctions, Gideon Mantell, Lewes Theatre, property prices, railways, Richard Ashcroft, Saint Richard de Wyche, smugglers. Bookmark the permalink.